Hostas are one of those plants that every home gardener has a place for. They are tough, long-lived, and perform well in shady situations. They come in a wide variety of sizes and textures, from smooth and glossy to heavily textured and variegated. They are perennial plants that rarely need to be divided, and as such they can be left for decades with little interference from the gardener. They make a wonderful, textured ground cover for areas where a lot of other plants won't grow, and they send up showy spikes of blue or white flowers between June and September, depending on the type. Hostas can be used in many gardening situations. They make wonderful ground covers for shady spots, and mix well with ferns, coleus, and impatiens. They boast striking variations in foliage colors, including green, yellow, blue-green, and variegated mixes. Indeed, leaf color is the first consideration when choosing a hosta for the home landscape. 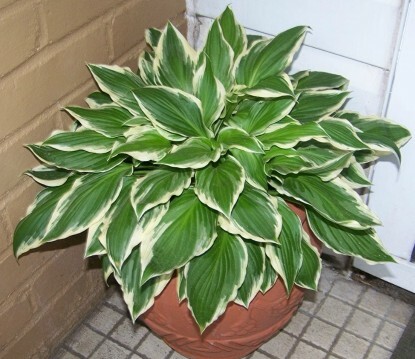 Hostas can also be used in borders, and make fabulous plants for Containers. Large single specimens can make striking, carefree, permanent accent plants. Hostas are widely believed to be finicky and hard to grow, but this is actually not the case at all. They do need plenty of water, so be sure to keep their soil moist during dry spells. They appreciate a well drained spot with decent soil amended with organic material. They do very well in the shade, but avoid the deepest shade, as they do better with a little bit of sunlight. They are hardy to zone 3, but don't do as well in the very hot tropical regions, such as Texas and Florida. They rarely need dividing, but if you want to share a plant in your garden, dig it in the fall. Disturbing the plant may keep it from flowering the next season, but the foliage will still be there to enjoy. You can propagate by seed, but the seedlings vary widely in viability, so cutting offshoots from the parent plants is the best way to increase your plants.